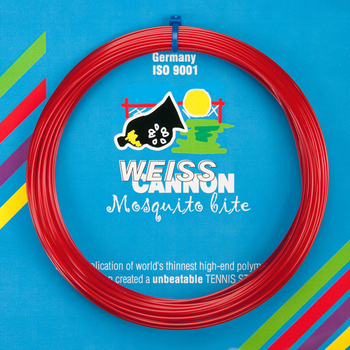 WeissCANNON is creating quite the buzz in the world of tennis strings with the world's thinnest HIGH-END poly-based string, Mosquito Bite. The dynamic power and strong spin capabilities, coupled with outstanding feel and pinpoint control will allow players to elevate their game to levels that is guaranteed to annoy opponents. Armed with Mosquito Bite your game will swarm helpless opponents throughout the match in the form of overpowering serves, vicious angles, and spin that will have balls striking lines with impunity! Unless your opponents happen to have a string called DEET, they will have no answers for the blood-thirsty assault. When all is said and done they will leave the court scratching their heads trying to figure out what exactly just hit them. In the spirit of sportsmanship, you might want to toss some Calamine lotion in your bag to offer them afterward. Construction: Premium quality poly-based string with freakishly strong chemical additives that are monomix reinforced. Advantage: Thin premium grade allows tremendous access to spin, control and power. The infestation lasts for weeks as the Mosquito Bite refuses to relinquish it's bite on tension, maintaining for an extended period of time. Like the other WeissCANNON premium poly-based strings, this string is manufactured under string ISO 9001 guidelines to help ensure quality and consistency so they always offer consistently great playing characteristics. Why We Carry This String: Ummm...because it's another awesome option from the WeissCANNON line of PREMIUM strings. I've played with this string in a hybrid set up and I love it!!! Very crisp and lively with a decent amount of power and nice spin potential. A little stiff so may not be for beginners or players with elbow problems. I like how thin it plays as well. So far durability is good, tension has held up well over the past 2 months. Got these Mosquito Bite strings in a used racquet I bought. Wow I am amazed at the spin, feel, control, comfort and power. Totally unexpected. Have used them for about a month. Plan to buy more. Extremely durable as well...can't believe they are an 18 gauge string. I am using this string as main in Donnay X-dark red 94 racquet with MSV Spin on crosses. I have played before with WC Turbotwist 1.18 and I feel mosquito bite as more comfortable. I feel the ball better so I control my shots better. Anyway, both, Turbotwist and Mosquito are great string. I am faithful Weisscannon player since couple of years. Why? These strings just play as you expect so no surprise for your form of shots during the game, no trampoline effect as with my previous strings after several matches.